A majority of the reviews noted how it feels really good right out of the box the Ignite EvoKNIT is. Several were highly-appreciative of the shoe’s excellent color combinations. The latest upper design from Puma offers a sock-like fit like never before in its line. Outsole durability is one of its best features, based on the comments of several runners. The Puma Ignite EvoKNIT works well for gym workouts, according to a handful of users. A handful of runners were impressed by the traction of this shoe, even in wet conditions. Some reviewers were pleasantly surprised by the flexible sole. The awesome style makes it a very popular casual or lifestyle shoe, according to a large number of reviewers. There are several color options and combinations to choose from. The Puma EvoKNIT is quite expensive. It feels a bit sloppy, according to some runners. There were others who badly wanted different width options. Puma jumps into the latest craze among shoe companies, which is the production of premium knit-like upper. In the Ignite EvoKNIT, runners are in for a shoe that tries to mix fashion and sports featuring an innovative mid-height upper that hugs the foot unlike previously provided by Puma. It has enough arch support, a surprisingly flexible ride, and tons of comfort for those looking for a stylish shoe that shines up to 10Ks. Great first effort on the materials. The evoKnit feels great on-foot. I just wish this shoe had a little more lateral support here in the side panels just to give you that extra security when you're doing something besides just kicking it in the streets with these. The quality is good. Puma goes in with the quality. The evoKnit Ignite is a winner. Given a wide release, this shoe could be a huge hit based on the knit craze, the ankle sock craze, and the overall look, which is sick. What I found best about this shoe was that I never had to worry about it keeping up with me. Whether I was running around town, putting in work at the gym, or stomping around in the mud with. 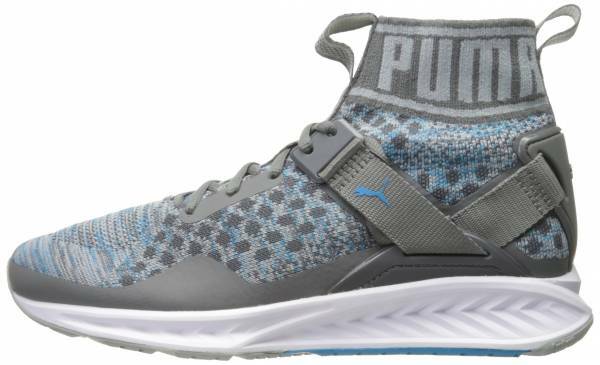 Without a doubt, the star of the Puma Ignite EvoKNIT is the knit upper that Puma hopes can stand toe to toe with the best in the business where this type of upper design is concerned. The shoe offers a sock-like fit that reaches just above the ankle for an upper that thoroughly wraps the foot in comfort. As the upper is almost entirely made of an EvoKNIT, Puma uses an ankle strap to secure this area. On top of this, there is a structured external heel counter to really lock the heel and provide security. The hard-wearing sole gets a boost in flexibility, courtesy of the deep flex grooves. It also compensates for the rather thick midsole foam to prevent the ride from feeling too stiff. Puma designed the Ignite EvoKNIT for those with medium to slightly narrower feet. It has moderate wiggle room in the forefoot for a natural splay of the toes while the heel is supremely secured. The arch relies mostly on the stiffer fabric in the midfoot for support. It runs true to size. The outsole of the Puma Ignite EvoKNIT uses a large number of flex grooves all over the shoe for optimal flexibility for such a well-cushioned shoe. Besides the numerous horizontal flex grooves, there is also a huge vertical flex groove that spans the length of the outsole. The transition from heel to take-off is enhanced by the presence of this vertical flex groove. There is EverTrack, which is in color black in this shoe is utilized in high-wear areas for durability. A softer blown rubber is found in some of the areas for traction and a little bit of cushioning. Puma’s brand-exclusive Ignite foam stretches across the entire midsole. It is of sufficient cushioning, durability, and responsiveness. The full-length design of the midsole gives more efficiency for the runner during the gait cycle. The totally seamless upper is mostly covered by Puma’s innovative EvoKNIT material, which is also utilized in the Ignite EvoKNIT 2. It has a sock-like fit that is luxurious in feel and comfort all the way to the collar. The upper is one-piece and quite stretchy that it can accommodate a variety of foot shapes. For structure and support, the Ignite EvoKNIT uses an external heel counter and an ankle strap. At the back of the collar is a heel loop for convenience.